With homeowners and designers rediscovering the beauty of sustainable, natural materials, natural wood is making its way back into our homes and is set to become a huge trend for 2014. For many years, artificial products and materials with an almost clinical air dominated our homes. As we embraced modernity and welcomed all things contemporary into our lives, the beauty and individuality of natural materials seemed to take a bit of a back-seat in our decor. Thankfully however, the tide is turning. With homeowners and designers rediscovering the beauty of sustainable, natural materials, natural wood is making its way back into our homes and is set to become a huge trend for 2014. Natural wood finishes were seen everywhere at last year’s design shows, and with natural wood shutters you can incorporate this look into your own home. In terms of style, wood is incredibly versatile – so a wooden shutter can easily suit either a contemporary or traditional scheme. Juxtapose the warm, honeyed tones of natural wood with flashes of white or grey for a cool and contemporary effect, and maybe even go for paler shades if you’re looking for a more up-to-the-minute interior scheme. Look out for woods such as Elm for a more traditional setting – allowing for a deeper stain, which in turn will show off the beautiful detailing of the grain. 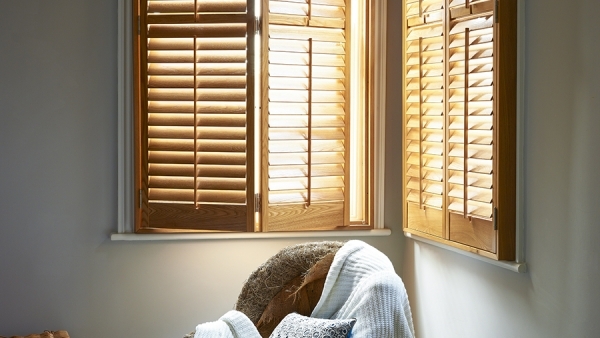 Shutters are an excellent way of getting wood on your walls and are far more subtle (and cheaper) than panelling. Shutterly Fabulous’ Poplar shutters come with the option of being FSC certified.